Here are selected some of the most impressive and unique trees of the the world. Circumference and diameter, if not stated otherwise, is measured at the narrowest place of trunk up to the 1.3 – 1.4 m height. Bois dentelle – Mauritius. Elaeocarpus bojeri (R.E. Vaughan) represented in the wild by just two trees. Tree has beautiful bell-formed white flowers. Café marron – Rodrigues. The only specimen of Ramosmania rodriguesii (Tirveng. & Verdc.) in the wild, discovered in 1980. 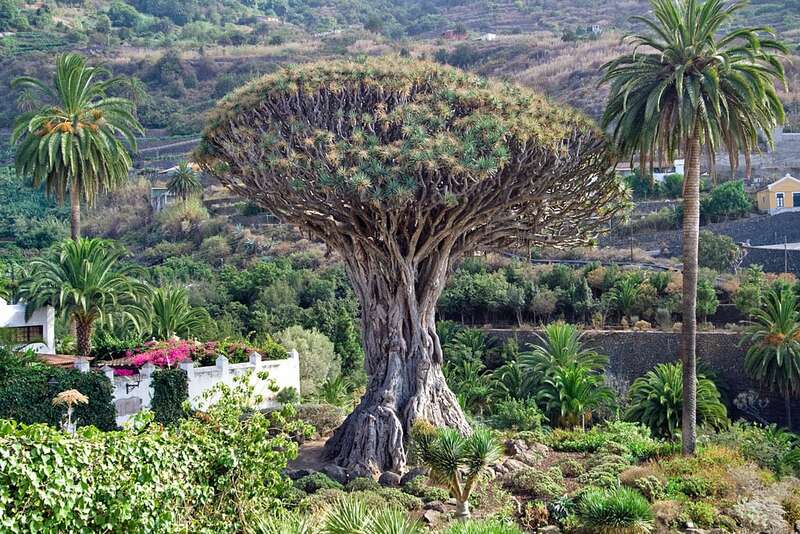 Drago Milenario – Spain, Canary Islands, Tenerife. Most famous dragon tree (Dracaena draco (L.) L.), a giant tree with a girth of 17.4 m and height of 16.4 m.
Encephalartos aemulans – South Africa, Natal. Just two trees 10 km away from each other, on a single hill in northern Natal. Encephalartos woodii (Sander) – South Africa, Natal. This treelike cycad does not exist in the wild anymore. Just few male specimens were seen in the late 19th century – early 20th century. Since then this plant grows in several plant nurseries. 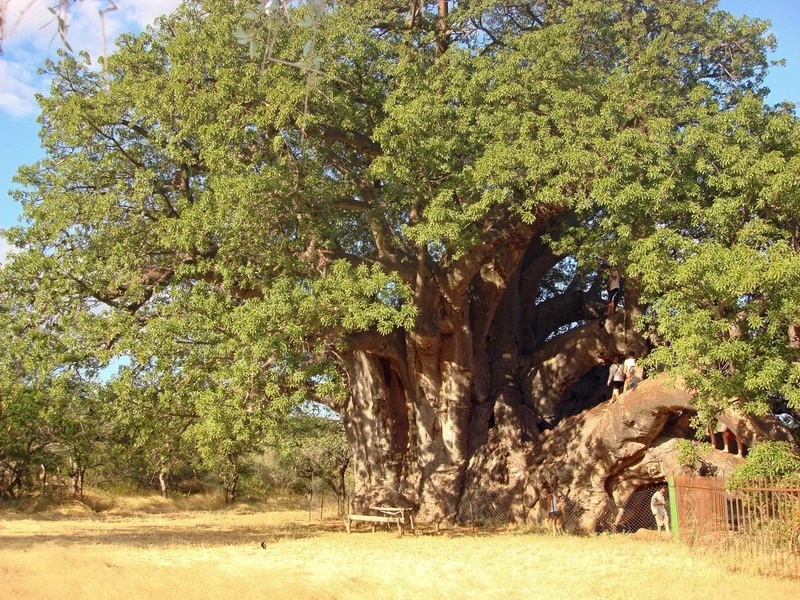 Glencoe Baobab – South Africa, Limpopo Province. Up to recent time – the stoutest baobab (Adansonia digitata L.) and stoutest tree in world. Diameter was 15.9 m, circumference – 46.6 m, height 16 m. In November 2009 split into two parts. Reakaly baobab (Ampanihy baobab) – Madagascar, Atsimo-Andrefana. Stoutest baobab Adansonia za (Baill. ), girth 23 m (plaque at the tree says that 27 m). Largest tree in Madagascar. Sagole Tree – South Africa, Limpopo Province. The largest tree in South Africa. This giant Adansonia digitata has a circumference of 33.72 m and height – 22 m.
The Cotton Tree – Sierra Leone, Freetown. Ceiba pentandra, symbol of the city, found growing in the town center in 1792 when here came freed slaves from United States. Girth over 12 m. Site for offering prayers for peace and prosperity. Jaya Sri Maha Bodhi / William Pfeifer, Wikimedia Commons, public domain. Baishanzu Baishan firs – China, Zhejiang. Extremely rare species of fir (Abies beshanzuensis Wu 1976) consisting of only 3 trees. Baji Cypress (King Cypress) – Tibet, Nyingchi. 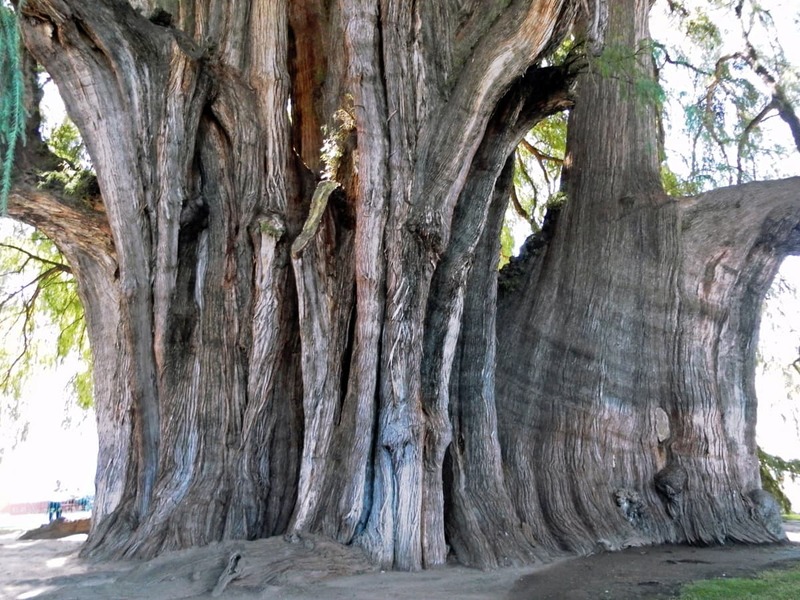 Largest known giant cypress (Cupressus gigantea W. C. Cheng & L.K. Fu), height approximately 46 – 56 m, diameter – 5.8 m, approximately 2,600 years old (not testified). Balete tree in Maria Aurora (Millenium Tree) – Philippines, Aurora. Balete (Ficus balete Merr.) – a species closely related to Ficus benjamina or its subspecies. Stem of this tree consists of multiple smaller stems and aerial roots and is hard to measure – but the diameter is 12 – 15 m. Height of this giant tree is 60 – 65 m.
Chinese Ginkgo King (Tiantan ginkgo) – China, Guizhou. Enormous Ginkgo biloba L., girth 16.8 m, height 50 m, age told to be 4,000 years. Jaya Sri Maha Bodhi (Sacred Fig Tree) – Sri Lanka, North Central Province. Oldest known human planted tree (Ficus religiosa L.), planted 288 BC from a sapling of Bodhi tree where Buddha became enlightened. Girth of tree changed due to additional trunks grown together with the original one. Kamou no Ohkusu – Japan, Kyushu. Camphor tree (Cinnamomum camphora (L.) J.Presl.) with a circumference of 24.2 m. Tree is some 30 m high, with estimated age of 1,5 thousand years. Menara in Danum Valley – Sabah. The tallest known tree in tropics and tallest flowering plant in the world, a 100.8 m tall Shorea faguetiana. Pakari Brikshya (Pakad, Falakasha, Devdaha banyan) – Nepal, Lumbini. Enormous, beautiful weeping fig (Ficus benjamina). Circumference of its trunk is approximately 25 m, height – approximately 30 m but the width of crown – some 150 m.
Sarv-e-Abarqu – Iran, Yazd. Oldest known individual tree in Asia, second oldest species of tree in world – more than 4,000 years old cypress (most likely Cupressus sempervirens L.). Age not proved. 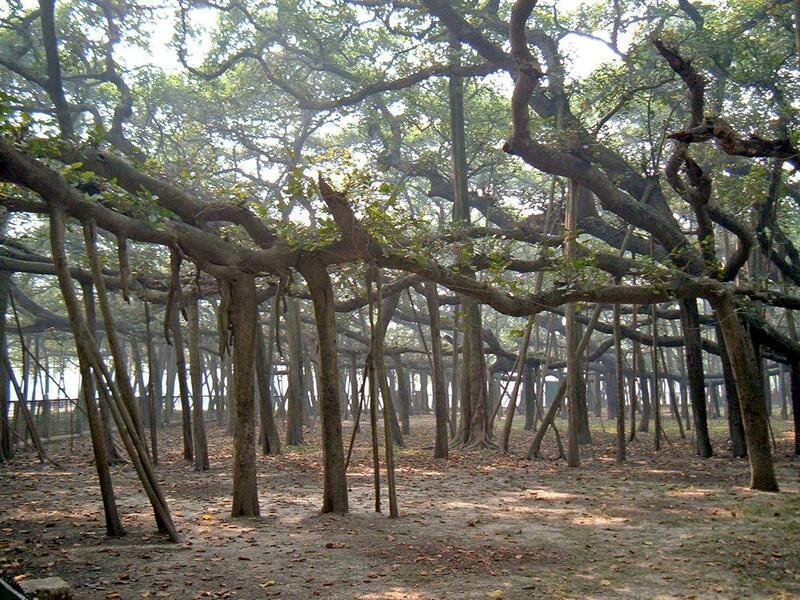 Beautiful, proportional tree, with a height of 25 m, circumference of trunk is 11.5 m.
The Great Banyan – India, West Bengal, Kolkata. Belongs to trees with largest canopy. This Ficus benghalensis L. is considered to be some 200 – 250 years old, area of canopy – 1.5 hectares, circumference of canopy – 1 kilometre. Height up to 25 metres, contains some 2,880 aerial roots rooted in soil. Thimmamma Marrimanu – India, Andhra Pradesh. World’s largest known single tree if measured by the area of its crown. Canopy of this banyan (Ficus benghalensis L.) covers 19,107 m². Tnjri (Skhtorashen Tree) – Azerbaijan, Yukhari-Karabakh. 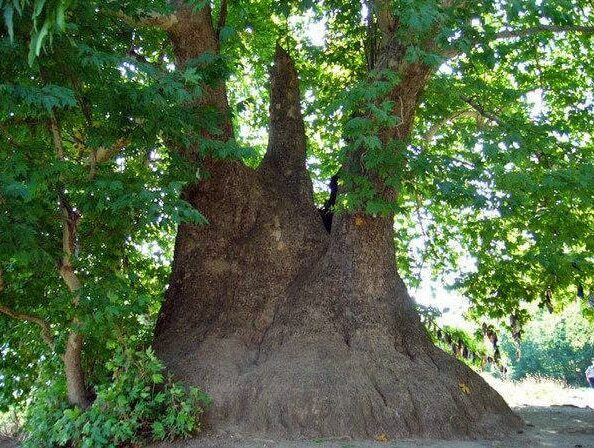 Giant Platanus orientalis tree, more than 2,000 years old, with a circumference of 27 m, 54 m tall. Tree of Life – Bahrain. Approximately 400 years old mesquite (Prosopis cineraria (L.) Druce) growing in a place devoid of water. 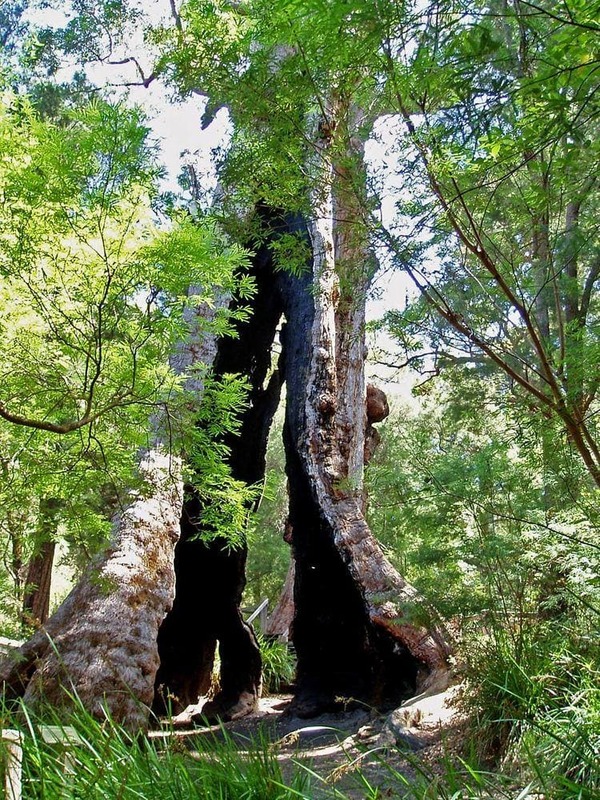 Arve Big Tree – Australia, Tasmania. Second largest eucalypt and the largest mountain ash (Eucalyptus regnans F.Muell.) in the world. Volume 360.1 m³, height 87 m, diameter 5.44 m.
Centurion – Australia, Tasmania. Highest known mountain ash and eucalyptus (Eucalyptus regnans F.Muell.) in the world. Height 99.8 m, diameter 4.05 m (girth 13.7 m), volume 268 m³. Has been at least 103 m tall but the top is broken. Gothmog – Australia, Tasmania. Largest Australian oak (Eucalyptus obliqua L’Hér.). Volume 337 m³. 53 m high, diameter 5.37 m.
Huon pine growth of Mount Read – Australia, Tasmania. Growth of genetically identical Huon pines (Lagarostrobos franklinii (Hook.f.) Quinn), stand of trees is 10,500 years old although none of trees is that old. Neeminah Loggorale Meena – Australia, Tasmania. Highest Tasmanian blue gum (Eucalyptus globulus Labill.). Height 90.7 m, diameter 3.88 m, girth 12.2 m. There are claims that other specimens of species reached up to 101 m height. Rullah Longatyle (Strong Girl) – Australia, Tasmania. The largest eucalypt and largest Tasmanian blue gum (Eucalyptus globulus Labill.) in the world. Volume 368 m³). Height 82.3 m, diameter 5.54 m.
Styx Valley Alpine Ash – Australia, Tasmania. Largest alpine ash (Eucalyptus delegatensis R.T.Baker). Volume 286 m³, diameter 5.41 m, height 72.0 m.
White Knight – Australia, Tasmania. Highest manna gum (Eucalyptus viminalis). 91,3 m high, diameter 3.30 m (girth 11.0 m), volume 180 m³. Giant Tingle Tree ("Hollow trunk") – Australia, Western Australia. Stoutest red tingle (Eucalyptus jacksonii), girth 22.3 m, 30 m high. Moreton Bay Fig in Bellingen – Australia, New South Wales. (Ficus macrophylla Desf. ex Pers. ), girth 29 m, 50 m high. Whitelaw Tree – Australia, Victoria. Largest (and also stoutest) shining gum (Eucalyptus nitens H.Deane & Maiden). 57.5 m high, girth 14.9 m, volume 200 m³. Banyan trees of Tanna – Vanuatu, Tafea, Tanna island. Many historical villages of Tanna island have giant banyan trees which are located in the centre of local culture – dancing place (nasara). Diameter of such trees reportedly reaches 50 m. Banyan in Lomteuheakal has approximate trunk circumference of 26 m. Banyan of Yakel village has a house built on top – this house is used for circumcision of local boys. 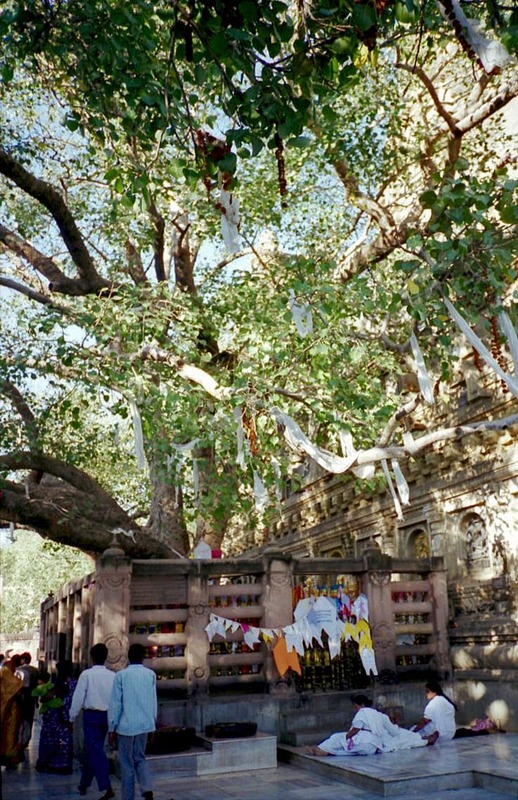 Kaluas is considered by locals to be the largest banyan tree in the world. Tree is extremely large, unfortunately no data about its size found. Klinki in Bulolo Valley – Papua New Guinea, Morobe. Reported (but not verified) 88.9 m high specimen of Klinki Araucaria hunsteinii (K.Schumann 1889) in 1941. These trees are very tall and there is high probability to discover very tall specimens today as well. Pennantia baylisiana – New Zealand, Great Island, Three Kings Islands. The only known specimen of (Pennantia baylisiana (W. Oliver) Baylis) in wild. Taketakerau (Puriri in Opotiki) – New Zealand, Bay of Plenty. The largest puriri (Vitex lucens), with a circumference of 21.3 m, height 20 m. Sacred tree, supposedly more than 2,000 years old. Burials inside its hollow have been found. Tāne Mahuta – New Zealand, Northland. Largest contemporary kauri (Agathis australis (D.Don) Loudon), volume 255 m³. Girth 13.77 m, height 45.2 m. Reports of larger trees in the forest. Te Matua Ngahere – New Zealand, Northland. 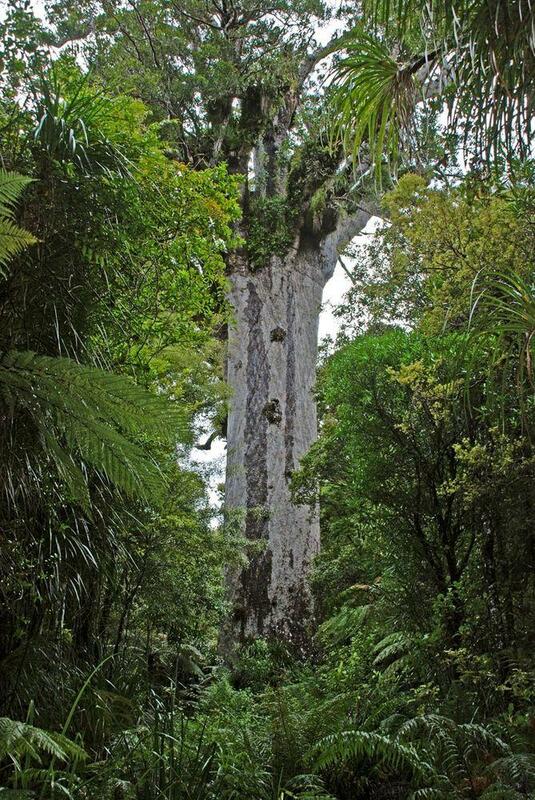 Stoutest contemporary kauri (Agathis australis (D.Don) Loudon). Girth 16.76 m, height 37.4 m.
Old Tjikko – Sweden, Dalarna. The oldest living clonal tree (Picea abies (L.) H.Karst.) in the world – its root system is at least 9,550 years old, while the tree above the soil is much younger. Starkste Ecke im Ivenack – Germany, Mecklenburg-Western Pomerania. Most impressive oak (Quercus robur L.) in Europe and the largest oak in Germany, 33 m high, circumference 11.25 m. The largest one in a group of 5 enormous oaks. Stirton’s Whitebeam (Sorbus stirtoniana T. G. C. Rich.) – United Kingdom, Wales, Montgomeryshire. This tree is known only from one specimen and discovered in February 2009. Included here to show that there are discovered new tree species even in Western Europe. Boole Tree – United States, California. Giant sequoia (S. giganteum (Lindl.)) of enormous size. Height 81.9 m, girth at the breast height 24.3 m, volume 1,203 m³. Carmanah Giant – Canada, British Columbia. One of the largest Sitka spruces (Picea sitchensis (Bong) Carr. ), 95.7 m high, diameter 3.66 m.
Daisy Spruce – United States, California. Second highest Sitka spruce (Picea sitchensis (Bong) Carr. ), 96.6 m high. Devil’s Canyon Colossus – United States, California. Largest incense-cedar (Calocedrus decurrens ((Torrey) Florin), volume 223 m³. 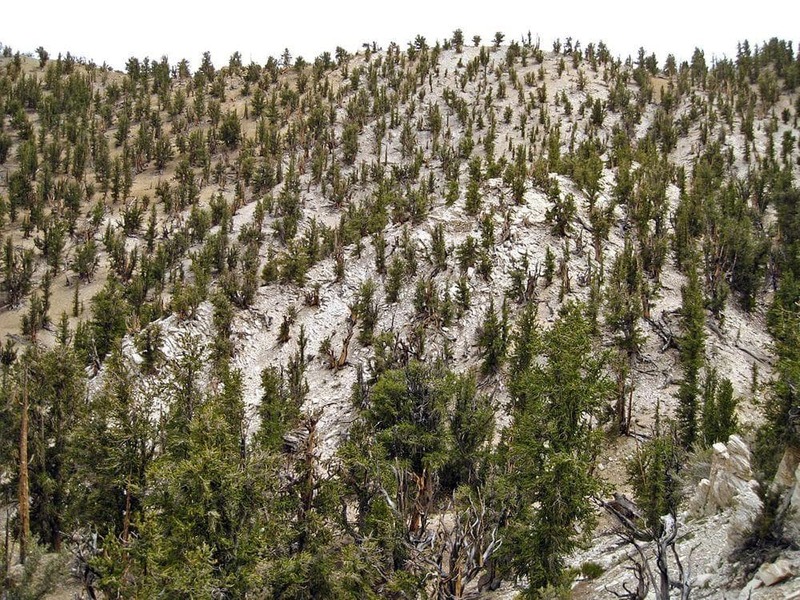 50.3 m high, diameter 3.78 m.
Dorrington sugar pine – United States, California. Largest sugar pine (Pinus lambertiana Douglas). 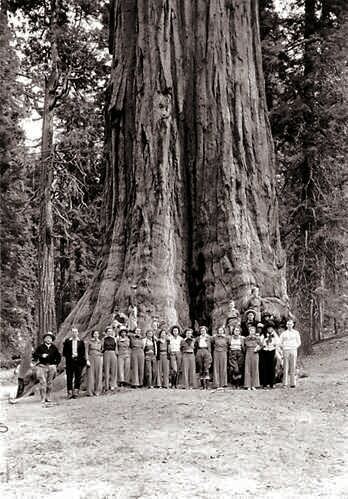 Volume 255 m³, diameter 3.53 m, height 66.1 m.
General Grant Tree – United States, California. Giant sequoia (Sequoiadendron giganteum (Lindl. )), second largest tree in the world. Height 81.5 m, girth at the breast height 27.8 m, volume 1,320 m³. This beautiful tree is declared as a National Shrine, memorial to those who died in war. General Sherman – United States, California. Giant sequoia (Sequoiadendron giganteum (Lindl.) J.Buchh. ), the largest tree of the world by volume. Volume 1,487 m³. Height 83.8 m, girth at the breast height 25.9 m. Believed to be 2,300 – 2,700 years old. Hyperion – United States, California. Tallest announced tree in the world (there are known taller ones), coast redwood (Sequoia sempervirens (D. Don) Endl.). 115.66 m tall, diameter 4.63 m. Contains 502 m3 of wood. In total more than 500 coast redwoods exceed height of 103 m.
Lost Monarch – United States, California. Largest coast redwood (Sequoia sempervirens (D. Don) Endl.) in the world. Volume 1,206 m³. Height 97.84 m, circumference 24.13 m (includes multiple trunks). Methuselah – United States, California. Great Basin bristlecone pine (Pinus longaeva D.K.Bailey). Oldest known individual tree in world, 4,844 years old. Raven’s Tower – United States, California. Reportedly tallest Sitka spruce (Picea sitchensis (Bong) Carr. ), 96.7 m high. Tallest Giant Sequoia in Converse Basin – United States, California, Converse Basin. Tallest giant sequoia (Sequoiadendron giganteum (Lindl. )), 95.8 m high. The Chandelier Tree – United States, California. Enormous coast redwood (Sequoia sempervirens (D. Don) Endl.) 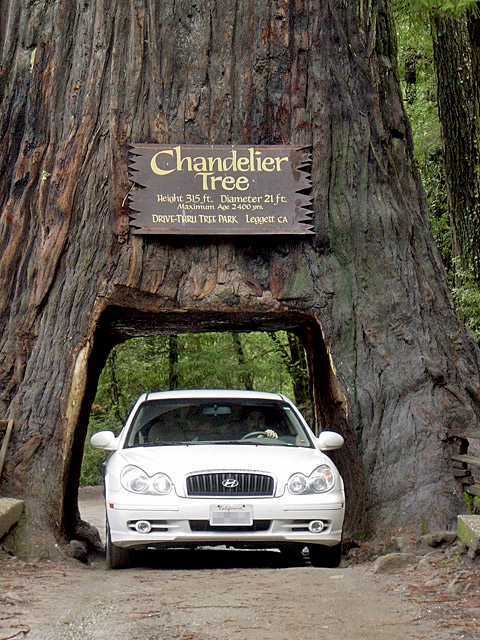 with large 1.83 x 2.64 m hole carved in the 1930s – car can drive through it. Height of the tree – 96 m.
Doerner Fir (Brummet Fir) – United States, Oregon. Tallest coast Douglas fir (Pseudotsuga menziesii var. menziesii (Mirb.) Franco) in the world. Height 99.8 m, diameter 3.54 m, volume 237 m³. Some time ago the tree was 100.3 m high. Noble fir in Goat Marsh – United States, Washington. Highest known specimen in species (Abies procera Rehder 1940), height 89.9 m. Tree is dead now. Pando – United States, Utah. Enormous clonal colony of single tree – Quaking Aspen (Populus tremuloides Michx.). Multiple trees covering area of 43 hectares with some 47,000 stems, all forming an single organism with a common root system. Total weight of Pando – 6,615 tons. Existence of larger clonal colonies highly possible. Queets River Spruce – United States, Washington. Largest Sitka spruce (Picea sitchensis ((Bongard) Carr.) in the world. Volume 337 m³. 75.6 m high, diameter 4.55 m.
Quinault Lake Red Cedar – United States, Washington. Largest specimen in species (Thuja plicata Donn ex D.Don). Volume 500 m³, including the hollowed middle. 55 m high, diameter 6.04 m.
Árbol del Tule – Mexico, Oaxaca. One of the stoutest trees on Earth, Montezuma cypress (Taxodium mucronatum Ten., 1853). Girth 36.2 m, diameter 11.62 m, height 35.4 m. Discounting the buttresses of trunk the diameter – 9.38 m. Volume 750 m³. Age estimated to be 1,400 – 1,600 years. Sacred Zapotec tree. Red Creek Fir – Canada, British Columbia. Largest coast Douglas fir (Pseudotsuga menziesii var. menziesii (Mirb.) Franco) in the world. Trunk volume 349 m³, height 73.8 m, diameter 4.23 m.
Alerce – Chile. Oldest known living alerce (Fitzroya cupressoides I.M.Johnst.) was 3,622 years old – this tree was felled. Alerce Milenario in Monumento Alerce Costero in Chile, Los Ríos is 3,260 years old. Dendroseris neriifolia ((Dcne.) H. & A.) – Chile, Juan Fernández archipelago, Robinson Crusoe Island. Only two specimens of this tree found in wild. Dendroseris gigantea – Alejandro Selkirk Island, Juan Fernández archipelago, Chile. Only one tree is found in the wild. Wax palms of Cocora Valley – Colombia, Quindío. The highest palms Ceroxylon quindiuense (Karsten) in the world. Although the measured height is 43 metres, it is told that these extremely slender palms can reach a height of 60 m, some sources mention even 80 m! 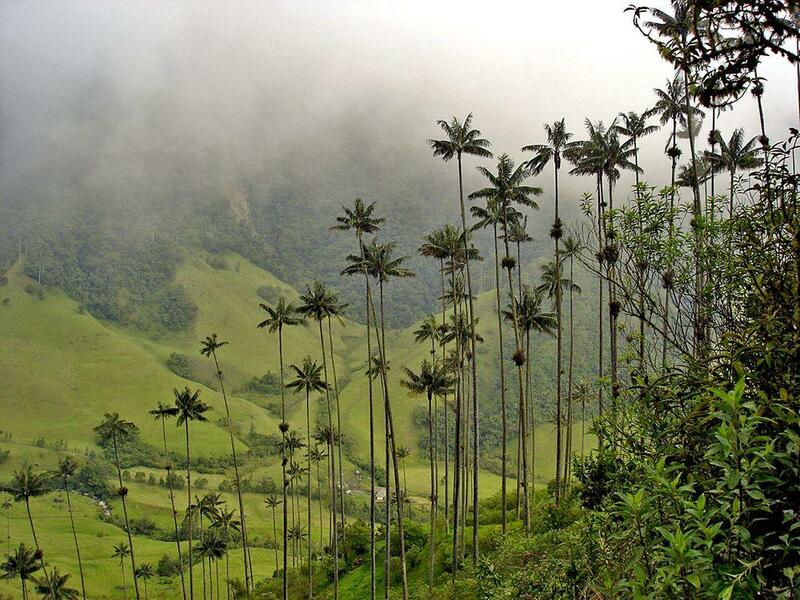 This palm grows in mountains up to 3,500 m high – this also is a record for palms. Over the last centuries people have been eager to cut forest and especially – large trees. None has doubts that in this way there have been lost many largest trees of the world. Unfortunately even at the beginning of the 20th century these measurements in most cases were of dubious quality and most of data are not trustable. Enormous coast Douglas fir in 1900, Washington. 9 feet diameter / From brochure "Seattle and the Orient"
Lindsey creek tree is the largest known single organism in world. This coast redwood (Sequoia sempervirens (D. Don) Endl.) was uprooted by a storm in 1905. Trunk volume of this tree was at least 2,550 m³. A Coast Douglas fir (Pseudotsuga menziesii var. menziesii (Mirb.) 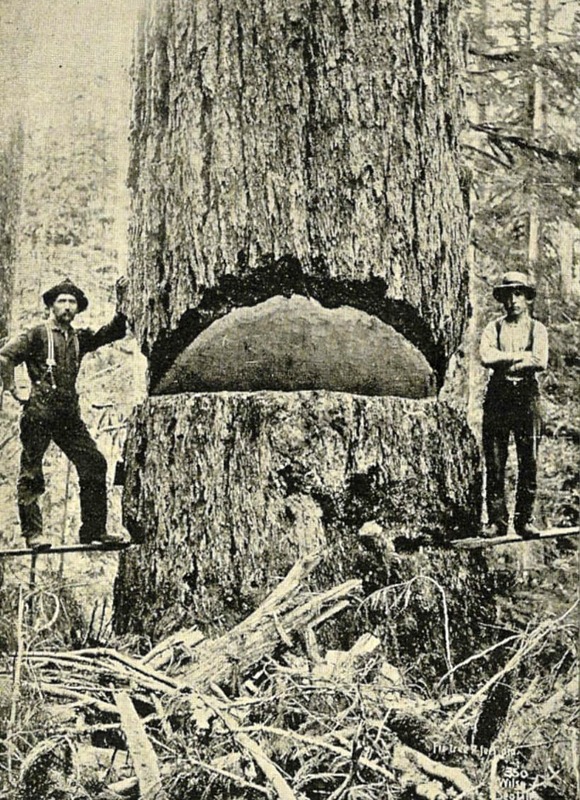 Franco) cut down in 1897 at Loop’s Ranch, Washington (United States) was reported to have measured 142 m in height. The Fergusson Tree (Eucalyptus regnans F.Muell.) in Victoria, Australia was 132.6 m high. It was cut down in 1871 or 1872. It is possible that the measurement was not exact. Exactly measured maximumt height for eucalypts is 114.3 m (Cornthwaite Tree, Victoria, Australia). Unfortunately this tree was also felled in 1881. God’s Valley Spruce (Oregon, United States) had enormous trunk – its diameter was 7.32 m.
There are pictures of western red cedar (Thuja plicata Donn ex D.Don) with a diameter up to 6.71 m.
Charles Darwin reports that he found a specimen of alerce Fitzroya cupressoides (I.M.Johnst.) in Chile with a diameter 12.6 m (circumference roughly 39.6 m). This is unusual as the largest specimens of this beautiful tree are much smaller nowadays – it seems possible that here is confused girth and diameter. 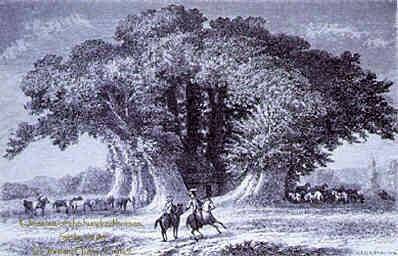 But there has been proven that Fitzroya can live up to 3,622 years long making it the second oldest tree species. Chestnut Tree of One Hundred Horses – Sicily, Italy. Sweet Chestnut (Castanea sativa Mill.). Once the stoutest tree in world – in 1780 measured circumference was 57.9 m. Now split in three stems, still growing. Considered to be 2,000 – 4,000 years old. L’Arbre du Ténéré once was the loneliest and most isolated tree in the world. This Acacia sp. was located in north-east Niger and there was no other tree closer than 200 kilometres from it. Tree died in 1973. This category includes the largest and most unique trees of the world. Trees for most part are perennial woody plants who have one main trunk and considerable size. There is no minimum size for a tree agreed and imagination is applied to some degree when distinguishing between shrubs and trees. Out of 10 existing plant divisions six include trees. Total number of tree species in the world still is a wild guess – may be 10,000 and may be 100,000 but most likely somewhere in between. Every month there are reported new tree species from the whole world, including the Western Europe. The largest trees belong to a comparatively small division – conifers (Pinophyta). Approximately half of the large and outstanding trees listed here are conifers. Conifers are the highest, largest and oldest trees in the world, conifer is also the second stoutest tree in the world. Most impressive conifers and trees in general are two species of subfamily Sequoioideae belonging to Cupress family (Cupressaceae): giant sequoia (Sequoiadendron giganteum (Lindl.) J.Buchh.) and coast redwood (Sequoia sempervirens (D. Don) Endl.). Both trees grow along the western coast of United States. Giant sequoia is the largest tree on Earth by volume, fifth largest by the height and third stoutest. Coast redwood is second largest by the volume, the highest tree on Earth and fourth stoutest. Several more conifers have exceptional size – such as Montezuma cypress (Taxodium mucronatum Ten., 1853) – third largest by the volume and second stoutest in the world, also coast Douglas fir (Pseudotsuga menziesii var. menziesii (Mirb.) Franco) – seventh largest by the volume, third tallest and the 45th stoutest. Next group of exceptionally large trees belongs to flower plants – these are eucalypts (Eucalyptus) belonging to myrtle family (Myrtaceae). Out of more than 700 species in this genus five exceed height of 85 metres, five exceed trunk volume of 200 m³ and eight exceed girth of 14 metres. Stoutest tree of the world most likely is balete tree (Ficus balete Merr. or Ficus benjamina). It seems that there is not a very high probability that some other species of trees can take over the record for volume, height or stoutness. But further investigations can change the list of the ten largest trees in each category significantly. 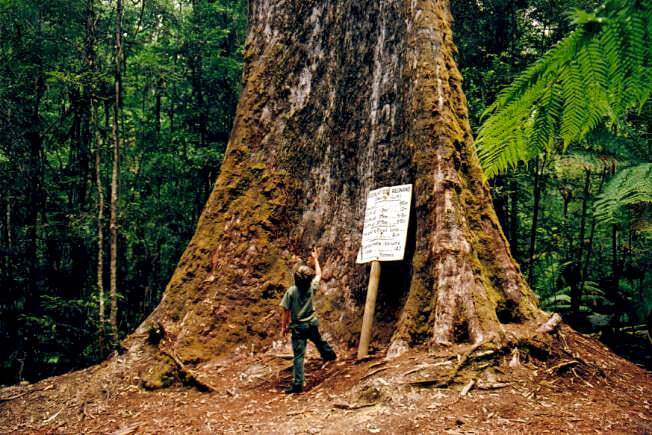 Nowadays there are two regions in the world with pronounced tree gigantism – coastal California, Washington and Oregon (United States) and Tasmania (Australia). Out of ten records regarding the trunk volume, height and stoutness in California, Washington and Oregon there are registered 9 records and in Tasmania – 8. This can be explained by the fact that both these regions of world really have giant trees and these magnificent monuments of nature have rised large interest. Many enthusiasts have searched champion trees in these regions and performed exact measurements to prove their findings. Other champion trees are located in diverse regions of the world – Madagascar, South Africa, Mexico, and so forth. Author recognises that lists here are far from being complete and here might be missing numerous great trees already well known in their respective localities. I am glad to announce that trees increasingly rare are "measured" by their imaginary age. It was not that long ago that tourist booklets announced that some tree is that and that many thousand years old and local people were virtually ready to fight to prove that their oak or cypress is exactly that old. Scientific justification? None! Just hundreds of tourist booklets and even some people with scientific degree repeating this mysterious figure once and again. Happily more and more people realise that the size of the tree tells little about its age. Nowadays naming such imaginary age of the tree is rather a sign of provinciality. In practice the age of the tree can be determined just in some cases, when the tree rings are well visible and the core of the tree is not hollowed, or when the date of tree planting is known with confidence. Nowadays more and more attention is turned to measurable values – volume of trunk, height, diameter, girth (also going out of trend), crown projection. Also here mistakes and uncertainties are common. Very often the girth is mingled with the diameter in favour of "increasing" the tree. Very often the tree is measured at soil level – of course, thus getting pretty impressive number. In such cases the height of measurement is not mentioned – thus, if you hear about English oak with 25 metres girth without further explanations – most likely it is measured at soil level and has a girth of some 9 – 10 metres at 1.3 metre height. Measurement should be made at the narrowest place between the soil and 1.3 – 1.4 metres height, athwart to the tree stem. If the tree stands on slope – measurement is made uphill. Large trees often have large buttresses and then a girth includes lots of empty air, not tree. Due to this more correct figure is average diameter of the tree. Of course, it takes some effort to calculate it. Height of the trees is hard to measure. For most part it is done by climbing the tree and measuring it. Being at shaky summit of giant tree at the height of 20-floor building is not for everyone – in fact very few in the world do this. Often the last metres of summit are not measured – it is too risky – and are not included in the height of tree. Another approach is using modern remote sensing technologies, such as LIDAR. Thus, for example, second tallest known species of trees in world – mountain ash or swamp gum named Centurion in Tasmania – was found and measured. This tree is 99.8 metres high – second highest tree species in the world. We can be sure that there are numerous very high trees in the world waiting to be discovered. Very tall trees grow in ravines and deep valleys, well protected from winds. Thus several tree enthusiasts from Alaska Pacific University found 8 species of trees exceeding 80 metre height in an area of 2 km³ in Sarawak, Malaysia in January – February 2007. Volume seems to be the best value to measure the size of a tree. But it pretty hard to calculate and there is a lot of ways to do it wrong. The volume of the main trunk is measured and compared most often. To do this there is determined diameter of the tree at different heights, height of the tree and then calculated the volume. Roots and branches are not included, hollows are included. This is fairly easy to do for many conifers who have one top. Measuring the volume for many other trees which have complex canopy might be too hard. Stoutest trees of the world – unique list of world’s stoutest trees (by species). Circumference of trees in this list exceeds 14 m and currently there are listed more than 50 species! 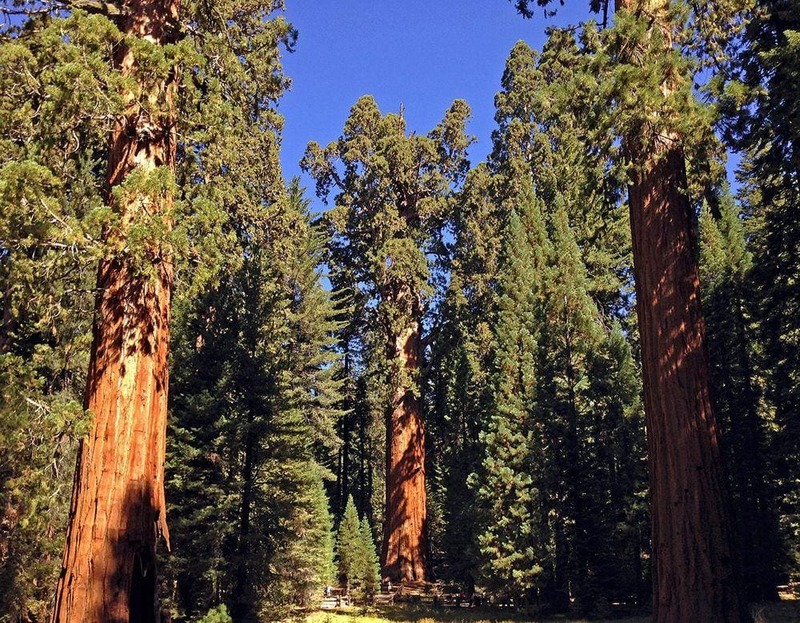 Tallest trees of the world – unique list of world’s tallest trees (by species). Height of these trees exceeds 80 m and currently it includes more than 15 species. Portrays the anatomy and growth of the redwood, describes the plants and animals that share its habitat, and looks at the history of redwood logging.